Battery life for most mobile workers can be a problem. 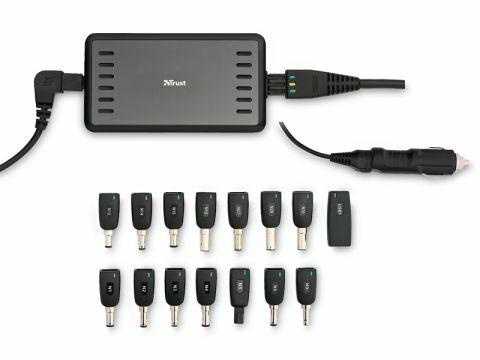 This Trust 16000 120W Ultra Slimline adapter is the world's smallest charger, but offers 15–20 Volts of power, as well as support for 5-Volt USB devices. With 120 Watts of power, or 140 Watts at a maximum throughput, it'll keep your laptop ticking over, as well as help to quickly charge any batteries attached. It comes with car and plane adapters, so you can use it anywhere. It also comes with a wide range of attachments to cover all the major laptop brands, but it's worth checking with Trust's website to make sure your particular model is covered. We found it came with automatic power switching, so you don't need to check the voltage of your devices. There is also a USB port, so you can also use it to charge your peripherals as well as your laptop.